Half-day theme itineraries (approx. 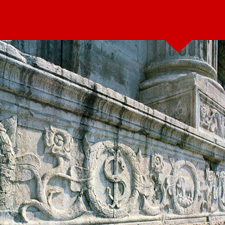 3 hours) dedicated to a particular historical period or some of the city’s most emblematic monuments. The itinerary takes in Rimini and its museum, evoking the historical feats of ancient Ariminum from the 3rd century BC to the 5th century AD thanks to splendid artistic treasures dotted around the city. Admire the Arch of Augustus and Piazza Tre Martiri (the ancient Roman forum), Tiberius’ Bridge and the Surgeon’s House, as well as the archaeological section of the museum. Strong and courageous warriors, but also lovers of art and beauty, the Malatesta dominated Rimini and a large area surrounding it from the late 13th century to the early 16th century. The famous Malatesta Temple, as well as Castel Sismondo and the Church of Sant’Agostino were all commissioned by the Malatesta. The guided visit includes some of the city’s monuments and some rooms at the Municipal Museum to discover coats of arms and the scintillating work of the masters of the fourteenth-century Rimini School: from paintings by greats like Giovanni Bellini and Ghirlandaio, to the sculptures of Agostino di Duccio and the prestigious medals by Pisanello and Matteo dè Pasti. The Malatesta Temple, formerly the Church of San Francesco, is one of the most important monuments of the early Renaissance and Italian fifteenth-century. Indeed, it boasts the presence of both late-Gothic elements and Renaissance inventions thanks to the genius of Leon Battista Alberti, Matteo de’ Pasti and Agostino di Duccio. It “merges” two periods and two geniuses: Giotto, who thanks to his extraordinary 14th-century Crucifix marked the end of the Middle Ages, and Piero della Francesca, whose famous fresco of a kneeling Sigismondo celebrates the strength and light that illuminated the 15th century. With the end of the Malatesta seignory, Rimini became part of the Papal States until the Unity of Italy. This itinerary touches the city’s churches and squares to reveal the face of Papal Rimini, starting in Piazza Cavour where the magnificent bronze statue of Pope Paul V Borghese stands. The numerous city churches house a rich art heritage which has been preserved thanks to the faith that created it. Giotto, Piero della Francesca, Paolo Veronese, Giorgio Vasari, Guido Cagnacci and Antonio Trentanove are just some of the many illustrious names whose work can be seen. The itinerary will be created based on the interests of participants and may also include the city’s historical centre and/or its quarters and Covignano. The itinerary aims to reveal the two souls of Rimini - the historical one and the seaside one - with at its clew the places dear to one of the city’s most famous sons, the film director Federico Fellini. The carefree life of a young man from Rimini in the age-old streets of the centre during the 1930s and his return after becoming famous to a symbolic site on the coast, the Grand Hotel, will help participants discover a Rimini that is very different to how it is normally depicted.